Novigrad (also known as Cittanova in Italian) is one of the most northern towns on the Croatian coast, located right at the top of the Istrian peninsula. 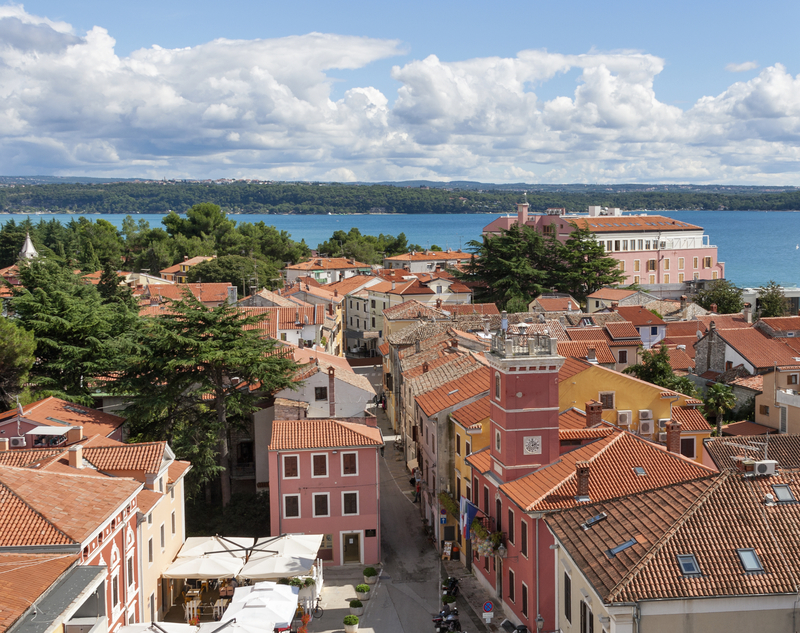 Perhaps overlooked by some of its more famous Istrian counterparts – including Umag, Porec and Rovinj – Novigrad has plenty of charm, excellent accommodation options and a number of fascinating sights as well. 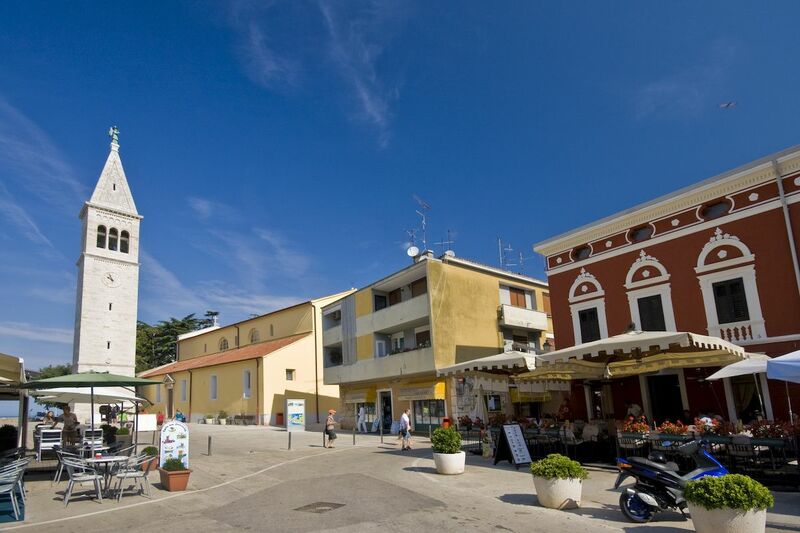 The town is also an excellent location if you fancy sampling some of Istria’s famous gastronomic choices! Although there are bus services from other towns in Istria, Novigrad is easiest to reach if you have your own (hire) car. The nearest airport is Pula Airport. See our page on Getting to Istria for details of flights to there from the UK, Ireland and elsewhere in Europe. Trieste Airport (and Venice Airport too) in Italy is also convenient as Novigrad is so far north in Croatia. Check out our pages on Travelling from Trieste and Travelling from Venice for details of how to travel over to Novigrad from Italy. The Church of St Pelagius and St Maximus is one of the main sights in town. (And its bell tower – shown below – is one of the main symbols of the town!) Located just by the main square, the church was largely build before the 18th century and houses the only Roman crypt in Istria. (Although this is closed to the public.) The bell tower was built in 1883. The Lapidarium Museum is relatively new, and is home to some of the Roman artefacts discovered in the crypt of the Church of St Pelagius (mentioned above). However, it also features contemporary exhibitions and numerous events through the year. Opened in 2007, Gallerion is a museum dedicated to maritime history and naval wars. Parts of town walls can be seen – the entire town was once completely encircled by them. If you’re staying in Novigrad with kids (or are perhaps a big kid at heart), then the water park Istralandia is only 7km from the town. Novigrad is home the critically acclaimed restaurant Damir i Ornella, a small and cosy restaurant with only six tables. Their motto is ‘from sea to plate’ and they take great pride in the freshness and quality of the fish they serve – something they have termed ‘Mediterranean sashimi’. Konoba Cok is another fine dining option, again serving top notch seafood dishes. In terms of hotels, there are a few larger resort-type hotels on the outskirts of the town (although Novigrad is not very big, of course, so it’s an easy walk to the centre). The Aminess Maestral Hotel (⭐️⭐️⭐️⭐️) and the Aminess Laguna Hotel (⭐️⭐️⭐️) both have pools, spas/wellness centres and other top facilities, and both are close to beaches. Right in the centre, the Boutique Hotel Rivalmare (⭐️⭐️⭐️⭐️) and the Hotel Nautica (⭐️⭐️⭐️⭐️) are two stylish options with excellent locations. Private rooms, apartments and villas are plentiful – see our Accommodation in Novigrad page for more details.